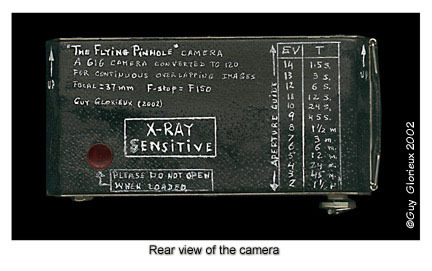 The Flying Pinhole camera was made from an old Kodak 616 folding camera whose bellows, lens, shutter, etc… were removed but whose front cover was retained and glued in the closed position. Black silicone was used inside to seal any light leaks coming from the hinge and sides. A hole was drilled in the centre of the cover and a copper/brass sliding shutter installed over a thin brass plate holding a .23mm pinhole. The camera's focal length is around 35mm on a 67x108mm frame, giving it an extremely wide angle of view (almost 120 degrees). In effect, the light barely reaches the extremities of the frame. The F-stop is F-150. The camera is loaded with 120 format film (there are lots of ways to adjust vintage cameras to 120 film). Fitting the two extremities from an old 616 spool into a 120 take-up spool allows the camera to use 120 film. The cylinder of each 616 adapter was cut to size and squeezed to fit into the grooves of a 120 spool so that the film is centered inside the frame of the camera. However, the numbers that one reads in the framecounter window from the 120 film will not match the dimension of the camera frame. If one moves the film on the basis of the numbers seen in the window, the images will overlap and one will get a negative with a continuous image made up of 16 interwoven pinhole images. 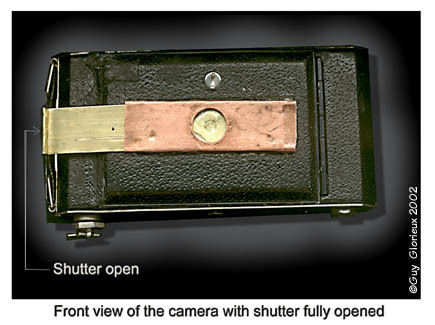 The sliding brass and copper shutter is the main feature of the camera on the front. The shutter slides open to the right and the brass slide can either stay in the copper fitting during exposure or removed completely. When the camera is not in use, it is recommended to place a piece of black electrical tape to secure the slide and avoid accidental opening of the shutter or exposure of the film. The main feature of the back of the camera is that it presents an Exposure Guide using the EV (Exposure Value) system. This is very convenient for those familiar with EV. Otherwise, the exposure is calculated using the traditional methods of measuring the light with a light meter and adjusting the indicated exposure time for an aperture of F-150. 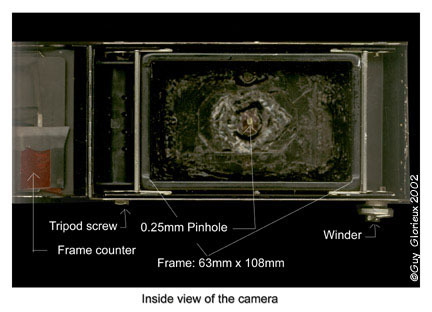 Also in the back is the frame counter that has been reinforced inside the camera with two additional layers of red inactinic plastic so that the counter window does not need to be covered all the time. The top of the camera has framing lines pointing out from the photographer to the scene being photographed, which makes the composition much easier. Underneath the camera (not shown) are the winder at one extremity and the tripod screw at the other. The fact that the tripod screw is not centred can make it a bit awkward to work with the tripod. But pinhole people are full of imagination and that should not be a problem for anyone. The camera is easy to load with 120 film using the two adapters made from a 616 spool. On the upload side, small pieces of tape have been put on the little metal rods designed to hold what should have been a 616 upload spool but is a 120 spool, so that the spool holes do not get caught inadvertently and suddenly block the upload spool. The camera is lightweight. It can fit in a vest pocket and be carried anywhere. The camera is easy to operate, but some basic care must be taken. Once installed on a tripod and once the composition is done, gently pull the slide from the shutter. 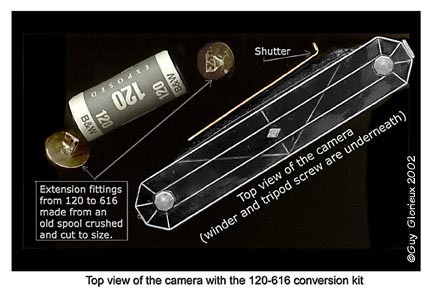 The shutter can be either pulled to the outside edge of the camera (it will remain in the copper holder) or completely out of the copper holder. The latter can be useful if exposure times are short. In which case, the photographer can put a piece of black mat board right in front of the pinhole to block the light, wave it out for the time of the aperture and put it back in front of the pinhole while the slide is being reinserted into the copper holder. Remember also that, because the angle of view is so wide, you will need to move VERY close to your subject, otherwise it will look minuscule on the negative. A distance of 30 to 45 cm is about right (even if this seems incredibly close). The Flying Pinhole camera was loaded with Fuji Reala film, which is slow (100 ISO). A slow film was chosen because they tend to cope more effectively with cross-border X-Ray checking. The parcel will be identified as containing a camera with X-Ray sensitive film inside. Once the picture is shot, the film is advanced to the next number as per the frame counter window in the back of the document. Each participant shoots two pictures and should wind the camera after your second shot so that it is ready for the next participant. Each participant is also asked to fill the camera logbook, so that the next participant can check whether the camera has been wound, etc... Details of the image recorded are kept secret, so that everybody ignores what is on the film.